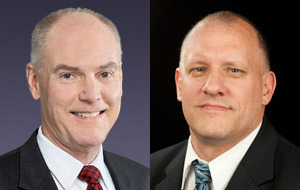 The Google and University of Maryland Cybersecurity Seminar Series will feature two thought leaders in industry and government to close out the Fall 2011 semester. Larry Cox, senior vice president and general manager of the Cyber & Information Solutions Business Unit, at Science Applications International Corporation (SAIC), will speak on November 17, 2011 at 5:30 pm in the Jeong Kim Engineering Building, Rm. 1110. The title of his talk will be "A First World of Cyber Security: Is it Time for a New Partnership of Nations?". Douglas Maughan, Cyber Security Division director in the Homeland Security Advanced Research Projects Agency, Science and Technology Directorate of the Department of Homeland Security, will speak on December 1, 2011 at 5:30 pm in the Jeong Kim Engineering Building, Rm. 1110. The title of his talk will be "Current R&D Initiatives in Cybersecurity." The events are free and open to the campus community and friends in industry, government and non-profit organizations. Registration is required. Larry D. Cox is senior vice president and general manager of Science Applications International Corporation's (SAIC's) Cyber & Information Solutions Business Unit (CISBU). As the head of CISBU, Cox is responsible for leading SAIC’s innovation and thought leadership in cyber and signals intelligence (SIGINT) for federal, commercial, and international customers. Before joining SAIC in 2005, Cox served as vice president of SIGINT strategy at Lockheed Martin. He was previously the founder and president of ORINCON Sygenex, Inc., a high-technology systems development company acquired by Lockheed Martin in 2003. Cox has also held various senior positions with the House Permanent Select Committee on Intelligence, the General Electric Company, and the National Security Agency (NSA). His commitment to developing future generations of cyber professionals includes support of science, technology, engineering, and mathematics (STEM)-oriented programs such as FIRST, CyberPatriot, Cyber Challenge UK, and the Maryland Cyber Challenge. Cox earned a bachelor’s degree with honors from the University of Maryland. Dr. Douglas Maughan is the Cyber Security Division Director in the Homeland Security Advanced Research Projects Agency (HSARPA) within the Science and Technology (S&T) Directorate of the Department of Homeland Security (DHS). Dr. Maughan has been at DHS since October 2003 and is directing and managing the Cyber Security Research and Development activities and staff at DHS S&T. His research interests and related programs are in the areas of networking and information assurance. Prior to his appointment at DHS, Dr. Maughan was a Program Manager at the Defense Advanced Research Projects Agency (DARPA) in Arlington, Virginia. Prior to his appointment at DARPA, Dr. Maughan worked for the National Security Agency (NSA) as a senior computer scientist and led several research teams performing network security research. Dr. Maughan received Bachelor’s Degrees in Computer Science and Applied Statistics from Utah State University, a Masters degree in Computer Science from Johns Hopkins University, and a PhD in Computer Science from the University of Maryland, Baltimore County (UMBC). The Google and University of Maryland Cybersecurity Seminar Series is organized by the Maryland Cybersecurity Center, a multidisciplinary initiative at the University of Maryland advancing innovative research, education, and technology development in cybersecurity. The Google seminar series features diverse speakers from industry, academia, and government, addressing a broad range of topics related to cybersecurity, including technology, policy, and economics, placing special emphasis on “the human factor” of cybersecurity. For more information, please visit www.cyber.umd.edu/seminars.